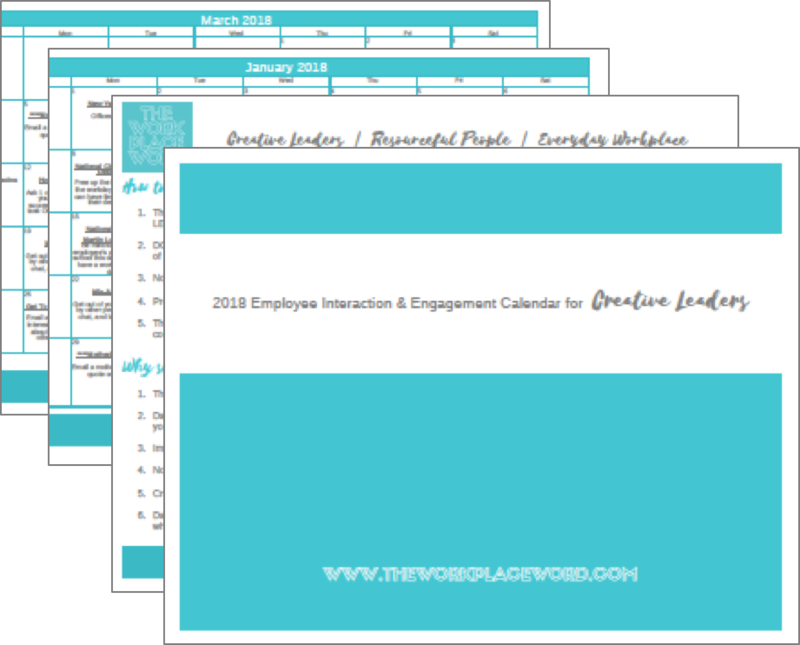 Get an ENTIRE year of employee engagement ideas with this 2018 Employee Engagement & Interaction Calendar. Check your inbox to confirm your email address and to opt-in. This calendar will prompt you with ideas to interact with your employees daily. Daily interactions with your employees will improve relationships and show that taking an interest in and communicating with them is a priority for you as leader. Improve your frequency and effectiveness in employee interactions and raise employee productivity and engagement. Be a Creative Leader! Be a Great Leader! Show that leadership cares about having an engaged workplace culture. Spend time with the people that make the company tick. Create connections and strengthen workplace relationships. Stimulate conversations and embrace non-business communications. Information on how to use the calendar. Why you should use the calendar. Your FREE PDF is on its way but first, let's make sure you're a real person. ;) Please check your inbox to confirm your email address and to opt-in.